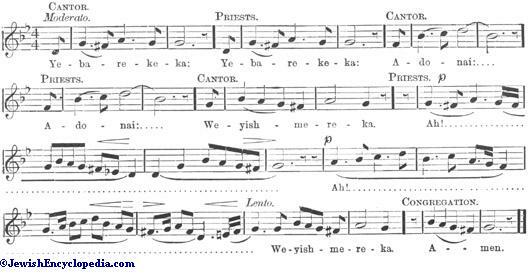 The main idea pervading the whole function of the priestly blessing rests upon the Name of God (Shem ha-Meforash), which is to be "put upon the children of Israel." While originally every greeting or blessing was accompanied by the pronunciation of the Name to make it efficient (see Ber. ix. 4; compare Ps. cxviii. 26), it became later only the privilege of the priests to use the Name in blessing the people; and the reverential sanctity attached to the Name lent to the priestly function a mystical and almost magical power. 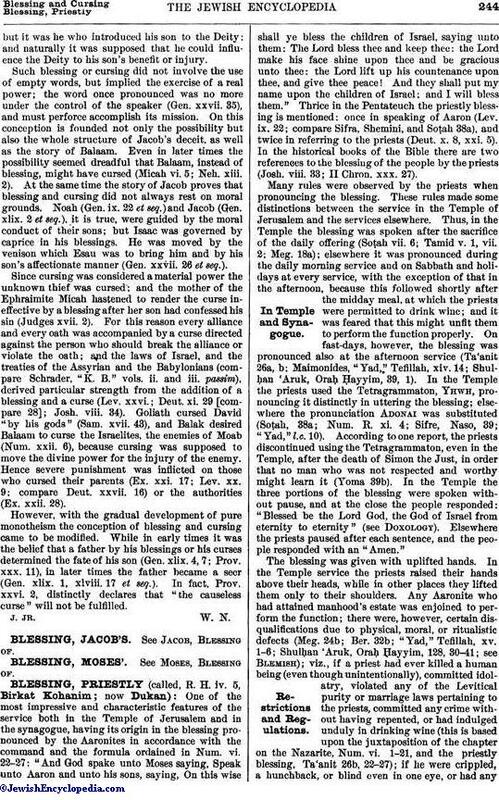 Hence the belief prevailed that during the lifting up of the hands by the priests, the Shekinah was hovering over their heads and its rays streamed through their open fingers, the people not being allowed to look on lest, like those who gazed at the sacred Ark in ancient times, they might be hurt, struck with dimness of the eyes and other misfortunes (Ḥag. 16a; Soṭah 39b; Yer. Meg. iv. 75c; Cant. R. ii. 9; Num. R. xi. ; "'Aruk," s.v. ; see, however, Tosef., Ḥag. 16a; and Yer. Meg. l.c., for more rationalistic views regarding the time when the Name was no longer pronounced). That great magical powers were long afterward ascribed to the priestly blessing may be learned from the advice given in the time of Rab Ashi to those troubled by bad dreams; viz., to offer a prayer that God might turn every curse into blessing (Ber. 55b)—a prayer which has been embodied in the common ritual, and is still recited during the singing of the blessing; the medieval mystics having added strange, fantastic, angelic conjurations to make it still more efficacious. The hands as upraised during the priestly blessing, with the thumb and first finger and the middle and ring-fingers so separated as to form little spaces through which the rays of the Shekinah streamed upon the assembled worshipers, in accordance with Cant. ii. 9 (see Soṭah 39b; Num. R. xi. ; 'Aruk, s.v. ), were adopted as the family badge of a Cohen. It is found thus on gravestones, objects of ecclesiastical art, imprints of books, etc., and is still so used, being frequently surmounted by a crown ("keter kehunah") (see Cohen). The fear that the people might gaze at the priest during the blessing, which was regarded as a perilous irreverence, gave rise to the custom of covering the head (and usually the hands as well) with the ṭallit during the recital of the benedictions. 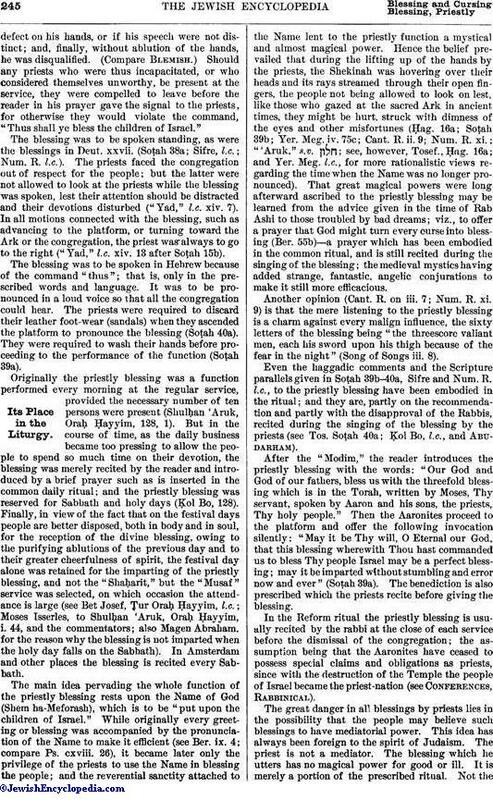 As the reader commences to intone the first of the three passages which form the conclusion of every "'Amidah," those Aaronites who desire to be released from the performance of the Biblical command withdraw from the synagogue, in order that they may not hear the reader call upon the Kohanim to carry out their duty. With them withdraw any Aaronites who may be mourners, or under the age of puberty, defective in person or speech, accidental manslayers, or married to divorced women—all these being excluded from participation. Those remaining remove their leather boots, after which water is poured over their hands by the Levites. The priests then assemble on the steps of the Ark with their faces toward it, each covering his head with his ṭallit; and when, during the service, the reader calls out to them, "Kohanim," they face right about, spread their hands horizontally above their heads, palms downward, in the manner indicated, and chant together: "Blessed be Thou, Lord our God, king of the universe, who hast sanctified us with the holiness appertaining to Aaron, and commanded us to bless Thy people Israel in love." Word by word the three verses are then dictated by the reader, the priests swinging north and south at suitable words in order to include the congregants standing right and left as well as those in front of them. At the close of each verse the response "amen" is given; and after the third verse they face about again, remaining before the Ark until the reader concludes the 'Amidah with the next paragraph. 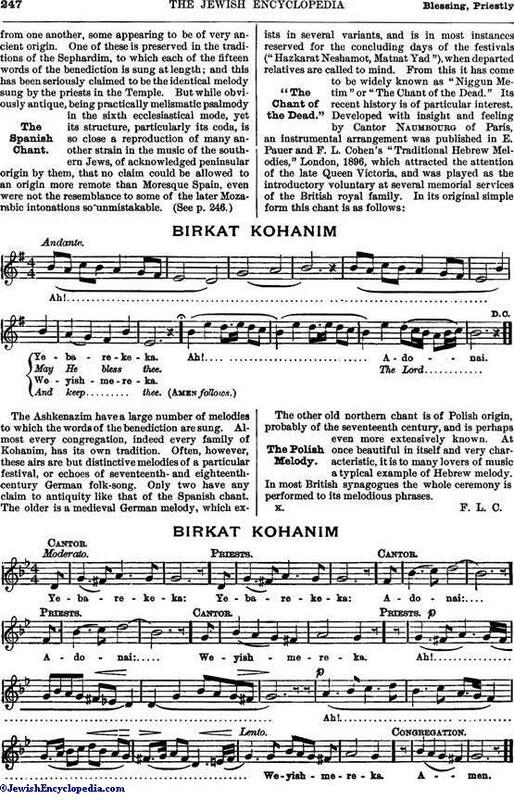 BIRKAT KOHANIM The Polish Melody. 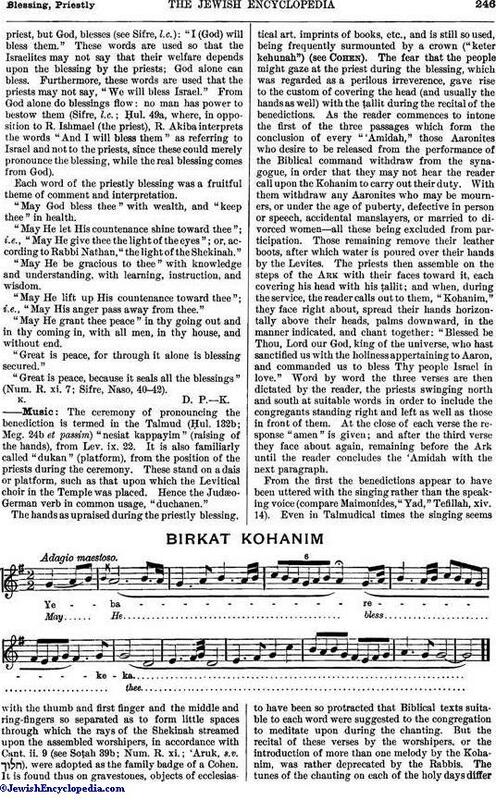 BIRKAT KOHANIM K. F. L. C.